As the beauty-filled feminine Moon danced between the fire-filled Sun and our spaceship Earth, Trude and I opted to channel the energies of the moment into creative work. Listening to the Eclipse is a two hour soundscape created during the 2017 Solar Eclipse. The scape has a Prelude, silences, a dance of tones, the moon throwing shade, and a return. The Prelude to the Eclipse came first and emerged from the time of the first kiss of shadow to 30 minutes before the 92% totality most of NC received. The eclipse soundscape, Sun Moon Earth Dance, occurred the 30 minutes before near totality, during near totality and the 30 minutes after. The tonal relationships involved in an eclipse can be drawn from a variety of data. I used the tones derived by Hans Cousto in the book The Cosmic Octave. The Sun tone is B, the Earth tone is C#. The interval relation is a whole tone. A whole tone has the edginess of proximity and a certain consonance as well. The whole tone interval is like an honest, long-term, intimate relationship. The Moon is G# and is beautifully consonant with Earth’s C# as its fifth. The Moon and Earth are like soul-mates. So the Earth changes partners every twelve hours or so alternately dancing with soul-mate and spouse. Eclipses change the larger cosmic pattern amongst these three. The Moon gets to “cut-in” between the Earth and Sun Mid-day, mid-dance. The scape is designed with orchestral voices of brass, strings, woodwinds,and bells along with solar winds, rattling bones and boiling water. I created and preset some loops of the primary intervals at play that I triggered while improvising on one of the midi instruments during the actual eclipse. Now, several days later, I am sculpting the piece. Using reverb, amplitude, crossfades, and panning, I place and move the source of each sound, creating sonic leaps and spins, and slow crossfades from one ear to the other. Here is where the story takes place – statements are made, pushed to the foreground or background, interruptions erupt, loud voices fade to whispers, laughter and great flair carry us into the future. 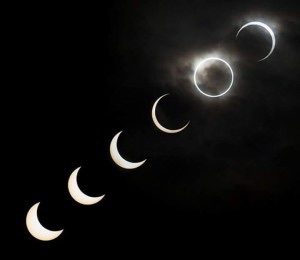 My intention with this practice was to listen closely in the moment and render the story of the eclipse as it occured through the sounds I chose. So the best way to listen to the recording is through headphones, and with the sense that you are listening to a wordless podcast about the eclipse. There are characters speaking and moving about the sonic space. There are arguments, discussions, laughter and mystery. What story do you hear when you listen?